Special thanks to both Dr. Carl Larson, Dickinson State University (North Dakota) for finding this article at the Library of Congress and to Jim McWilliams of Dickinson State for making a copy of it available. 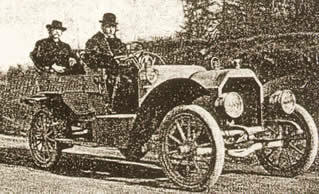 MOTOR, May 1906 (p. 45). MARK TWAIN AS A MOTORIST. WHAT THE HUMORIST THINKS OF MOTORING. A CHAUFFEUR WHO WAS NOT HIRED. If Mark Twain's "Jumping Frog" could for one moment know the strenuous life that the great humorist leads nowadays, he would probably choke up a few ore shot, give one wriggle and make one last, grand jump from his crumbling sepulcher. Mr. Samuel Clemens, better known to millions of people as "Mark Twain," enjoys motoring immensely and is a remarkable pattern of a motor enthusiast who is seventy years "young." 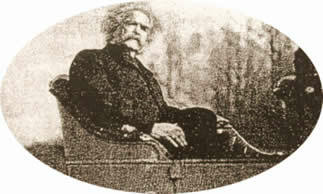 Several years ago Mark Twain's health was in a "terrible state of condition," but now, with his three to five meals a day, plenty of rest in bed and motor trips, he finds himself stronger and healthier than many men half his age. He has a much greater preference for a motor-car than for a bicycle and considers the former a machine far superior to the latter. "I do not own a motor-car," says Mr. Clemens, "but I recommend them to all my friends and advise them to buy a car - so that they will come around and take me out in it. Somehow or other, riding over a rough road in a motor-wagon jolts certain parts of my torso that need to be jolted, but seldom ever do get jolted, same as when I run up stairs. It's splendid exercise and limbers up and promotes springiness - of the stair boards." The accompanying pictures of Mr. Clemens in an Oldsmobile show him as he really is. The top one, although quite small, depicts him exactly as he looks when interested in any particular subject. His deep-set eyes and wavy hair, and his nearly serious stern, yet kindly expression, are all noticeable. Few men have ever had so many awful portraits of themselves printed in newspapers and elsewhere as Mark Twain. His usual cigar reposes in his left hand, in the above photos. He refrained from smoking long enough to have his picture taken. This broke one of the cast-iron rules laid down by his own individual Board of Health which is: "Never smoke while asleep and never refrain from smoking while awake." The cigar here shown is doubtless on of those which he buys at the rate of $6 per barrel. He admits that they make considerable noise when they burn, but he smokes them nevertheless. While Mr. Clemens delights in speeding, he wants to do it all on a country road, where there will be no danger to life or limb. The carelessness of chauffeurs and the way they break the laws in not having the car numbers displayed led Mr. Clemens to write an article not long ago, which appeared in one of the monthlies. He was further prompted to do it, owing to the fact that a member of his family had come very near being killed by a reckless driver, and Twain himself also had several close shaves. He suggested a punishment to fit the crime for those who knock people down and do not bother to stop and have such small indistinct numbers that they cannot be read even at a short distance. He recommends that offenders should be forced to carry numbers on the rear of their machines, two, three and four feet in height for the first few offences; larger numbers for chronic cases. This awful disgrace would cure them, he thinks. It is most interesting to hear this three-score-and-ten-year humorist tell of automobiling. Many stories about him in this connection have been circulated at dinners, in newspapers and as "fillers" in farm and home magazines. Many of these, some from patent medicine almanacs, are very new and surprising to Mr. Clemens. They give complete details of little accidents and adventures in advance, so that when Mr. Clemens reads about a certain breakdown and certain comical things that he said, he is able to guard against and avoid that accident and he saves all the witty sayings that it was foretold he would utter upon that occasion, for some future adventure. Twain was visiting a physician friend of his not long ago and tells how the medical man wanted to engage a new chauffeur. The first applicant for the position was a big, strapping six-footer with great broad shoulders, who looked strong enough to pick up a touring car and carry it. The doctor admired his splendid physique, but doubted if the man possessed much mechanical ability. "Have you had much experience running motor cars?" he inquired. "Sure," was the straightforward answer. "But have you much technical knowledge of machinery? I want someone who can make repairs when the car breaks down. Do you know how to take gears apart and take out the clutch, or put on new tires?" The bulky applicant said he could do all these. "Well," ventured the allopath, "as far as your physical condition is concerned, you certainly look strong enough to take good care of a car, if you can run it. What is the first thing you do when you find that your carbureter is out of order?" "Well, I tell ye, doctor," replied the other, "I honestly don't never have no trouble with it. It never gits out of order. I ain't been sick one day for the last two year."